Thinking back on last year, I immediately frown and wonder just what it was I actually did during the year that could hold some significance for me. But then a simple scroll through my Instagram and all of a suddenly I have a hurried, messy scribble of a list detailing all of the wonderful events and creative pursuits I managed to fit into the year! So, listing in chronological order, let’s review the year that was 2018! Was that a little bit too deep and depressing for a beginning paragraph? Oops! My bad! What I was trying to say before going off on a weird tangent, four days into 2018 my parents, some family friends and I sailed away to visit New Zealand! Although it was my second time visiting, I loved every. Single. Minute! 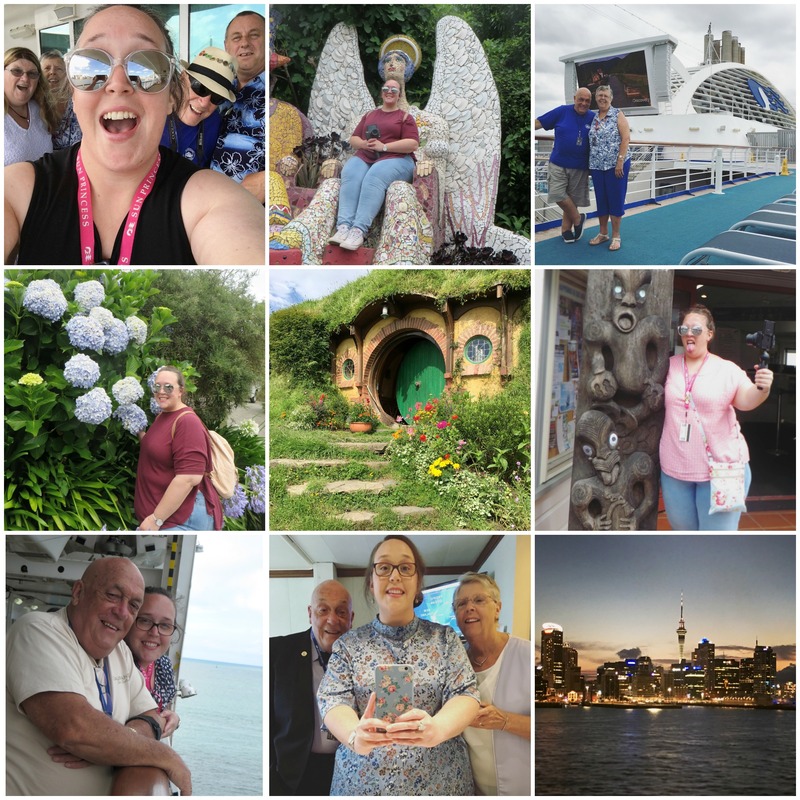 We visited all of the major city/towns along the east coast of the country and even got the opportunity to visit Hobbiton! It was the best day ever. I did a vlog series on my YouTube channel, filming and documenting the highlights of our trip. I recently watched it back and had totally forgotten just how awesome and fun our holiday together was! While on our cruise to The Long White Cloud, another little Rolfe entered our family! Zayne Paul arrived on the 6th, healthy, happy and endlessly squishy and sweet! The end of January saw me finally piece together my mammoth Pixelated Rose Quilt top. I made it a priority to get it finished by months end to then begin quilting it. As of today, this quilt is half basted, roughly folded and hung loveless over a chair in our living room. I got a new sewing machine, baby!! Whoo! I spent a ridiculous amount of money on a new gadget that I knew would become one of my most beloved and treasured items that I own! It’s taken us a little while to bond and get used to each other but I think we’ve got there. We’re in tune with what needs to get done, how to get it done and with what force, strength and/or delicacy the project at hand needs. 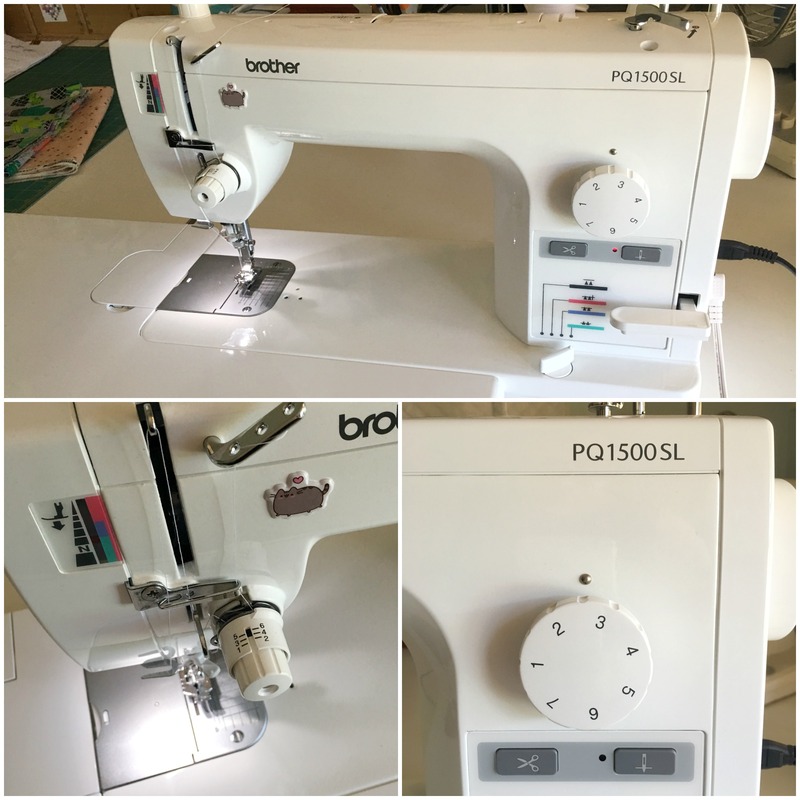 The machine I bought is a Brother PQ1500SL. On the 1st of February, I finished piecing together an old-ish WIP I had piled in a sad and dusty corner of my sewing room. And so my Simple Cross Quilt was born! I went on to finish this about a week later, with it being the first quilt I ever quilted with my new sewing machine. I love this quilt so much. The pops and clashes of colour and print, the fun and whimsical cat print on the back to the classic gingham binding I wrapped the quilt in. It’s simplistic yet busy nature makes my heart sing and my face smile every time I see it! I became more serious and put more focus into making Swoon blocks just because, you know! Cracking on to May, while a Swoon Quilt top lay in the shadows waiting for me to find it again, I started a new Quilt Along series on my YouTube channel! We delved into the world of mini blocks. 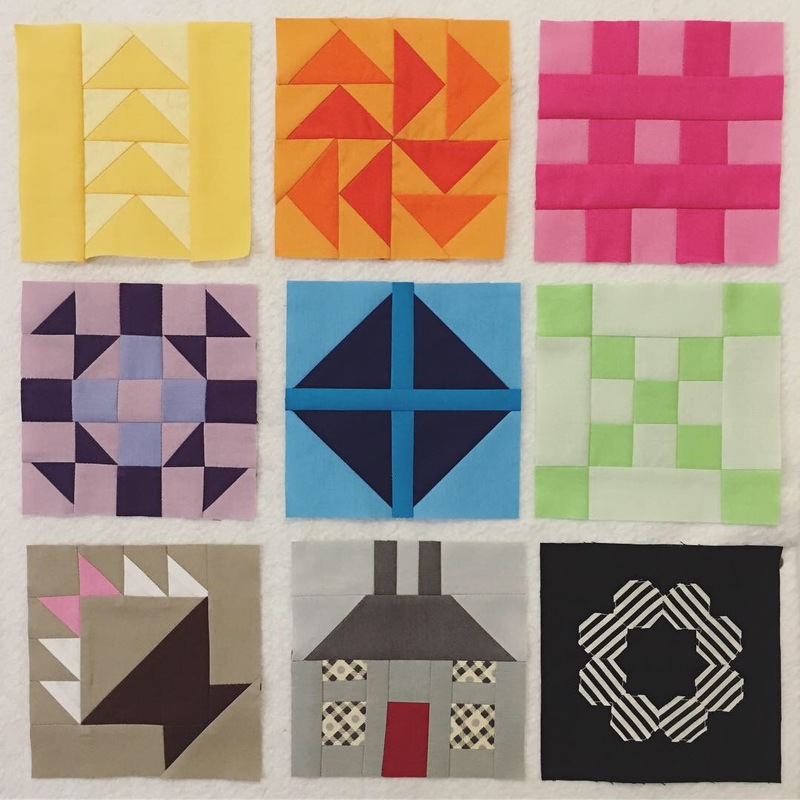 A concept that I’ve introduced a few times on my channel in various block tutorials but never as a complete set to be then pieced together into a quilt/wallhanging. This month saw me finish another WIP that had been lying unloved somewhere in a deep recess of our house! 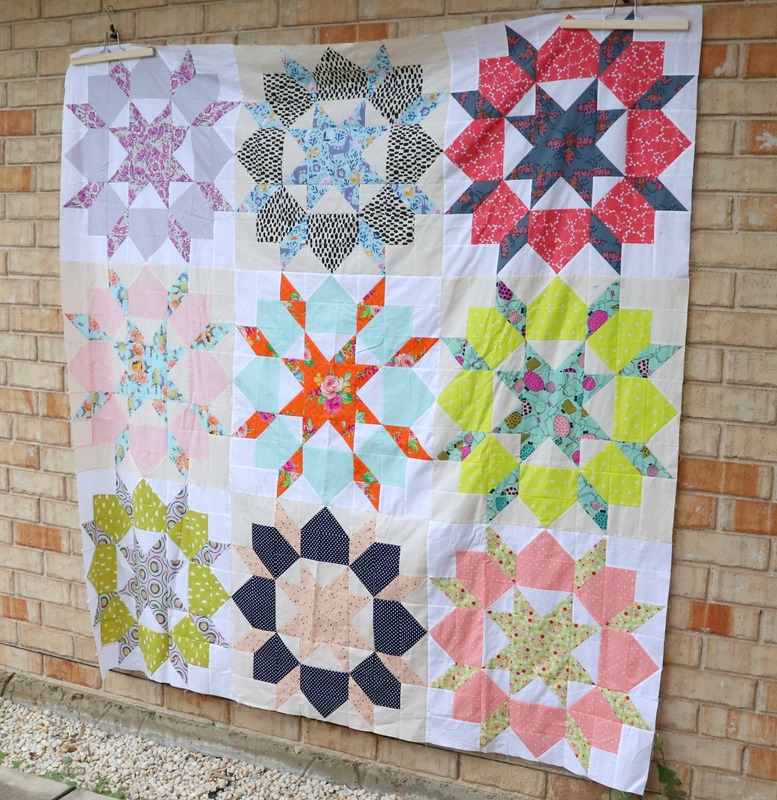 I’ve always loved this Friendship Star Quilt. The colourful geometric triangle print, the bold white square centers and then a richly dark and comforting navy background tying all of the elements together! 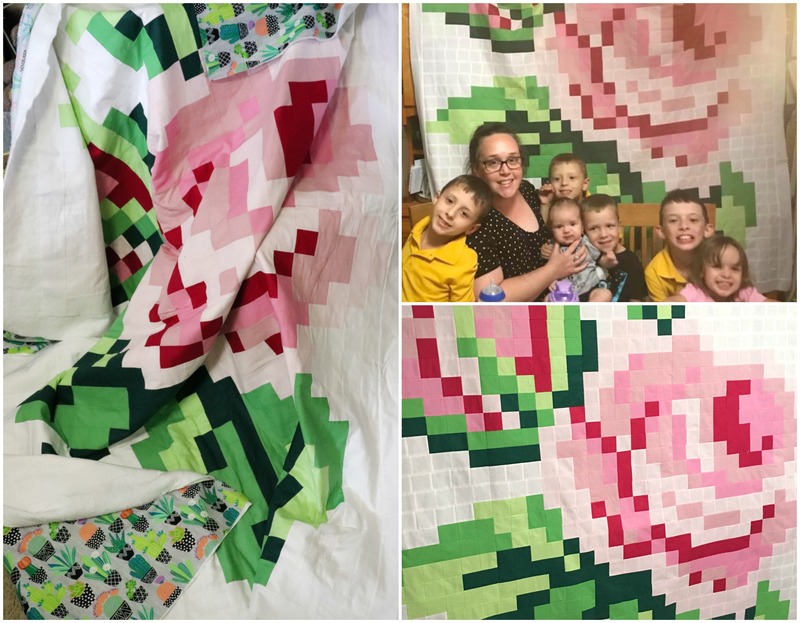 This quilt has been a real labour of love over the year, having been quilted once and then having all of the stitches ripped out because I hated my terrible attempt at FMQ! The quilt has been scarred from this. At times you can see a faint messy snail trail, a ghost of where past stitches have been. I love that these lines add a history and a story to its journey of finally being finished! 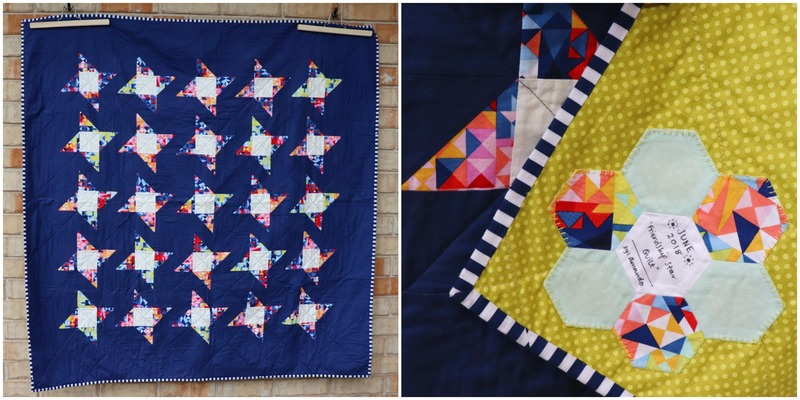 The finishing touches to this quilt are perfect! 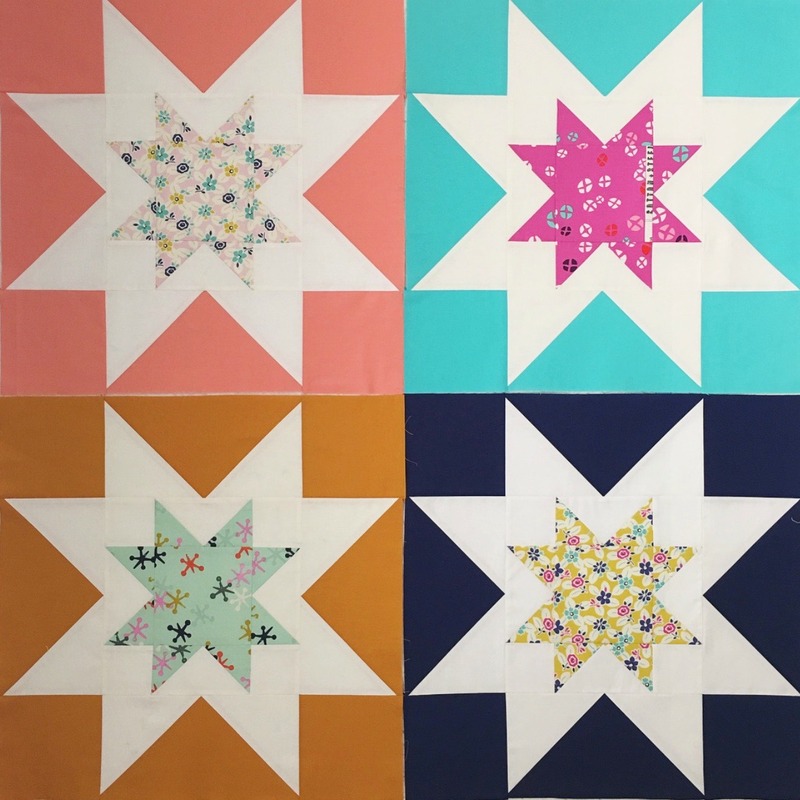 The backing is spot on with the colours in the print in the blocks and the binding I used was the exact same fabric I initially was going to use when I first starting making plans for this quilt. The label is pretty perfect too if I may say!! And then came July. 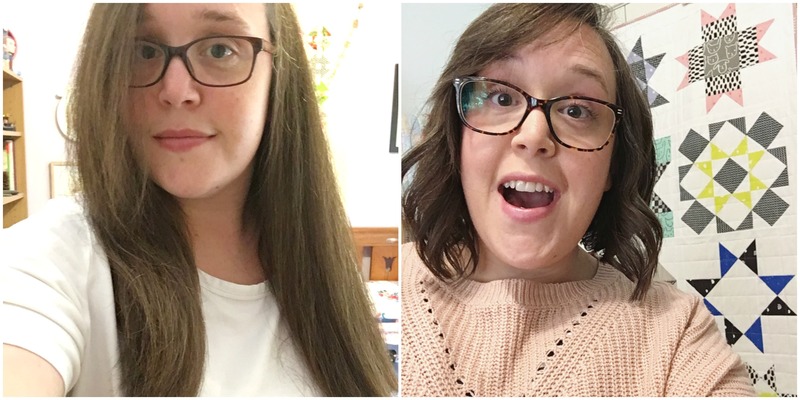 A month where I cut off all of my thick, long and wavy hair and opted for a shorter and swishy bob cut that I’ve thankfully loved over the past 6 months! And can you believe it?! I finished piecing together another very old WIP! 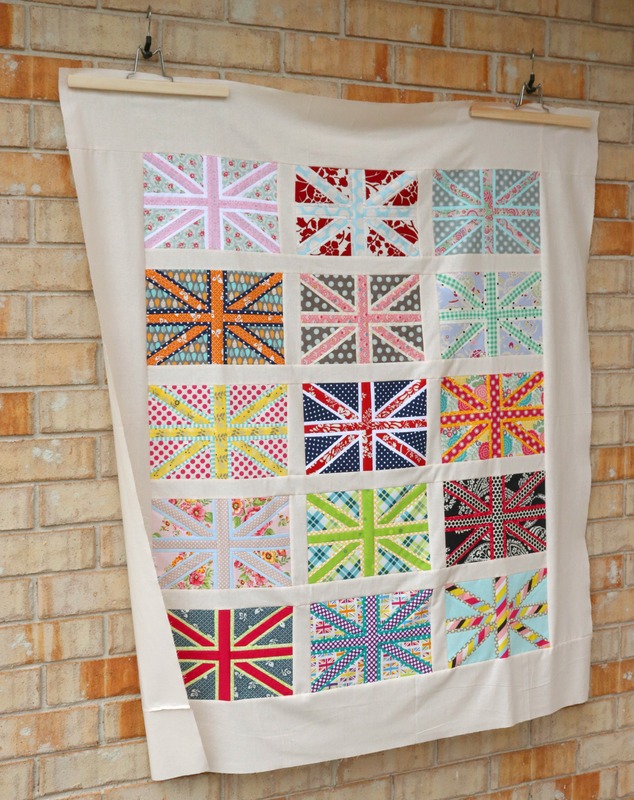 I think the very first FPP Union Jack blocks I made were back in 2012?!?! And here it is, 2018 and I finally sashed and pieced them into a beauty of a quilt top! I had completely forgot how many I had actually made and couldn’t believe all of the different and fun prints I matched together. I cheekily started a new quilt top also. I began, quite out of the blue, making Lucky Star blocks. 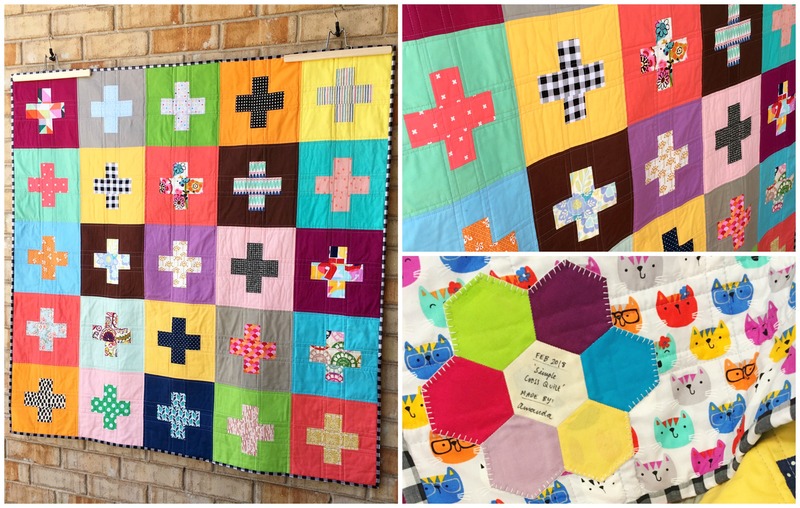 Inspired by my Simple Cross Quilt, I wanted to make another where the solid background fabrics where different in each one, with the colours clashing on either side of the blocks and creating distinctive squares and patterns. So far, I’ve made five, with another two ready to be cut and pieced. I’m hoping to make nine blocks all up which I think will make a pretty decent sized quilt. 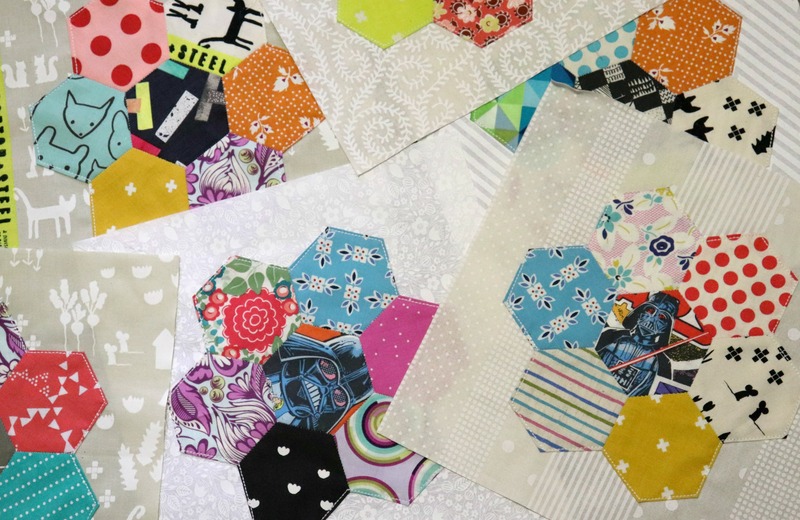 I became addicted to making colourful Hexie Flower blocks. I would sit for hours basting 2.5” hexies and then stitching them into funky flower templates. With December, however, comes Vlogmas! And Vlogmas very quickly turns into a month that is fast, chaotic, stressful, oh-so Christmassy and is jammed packed full of birthdays for our family! As much as it stresses me out, I strangely and truly love doing Vlogmas. It gently and very quickly forces me to be productive, creative, savvy in my time management skills and gives me an odd sense of purpose and contentment. How people daily vlog all year round, I got no idea! My head isn’t big enough to feel all of those emotions all day everyday! During Vlogmas, I got so many things made and finished! Two projects I’ve always wanted to make were finally ticked off the list! 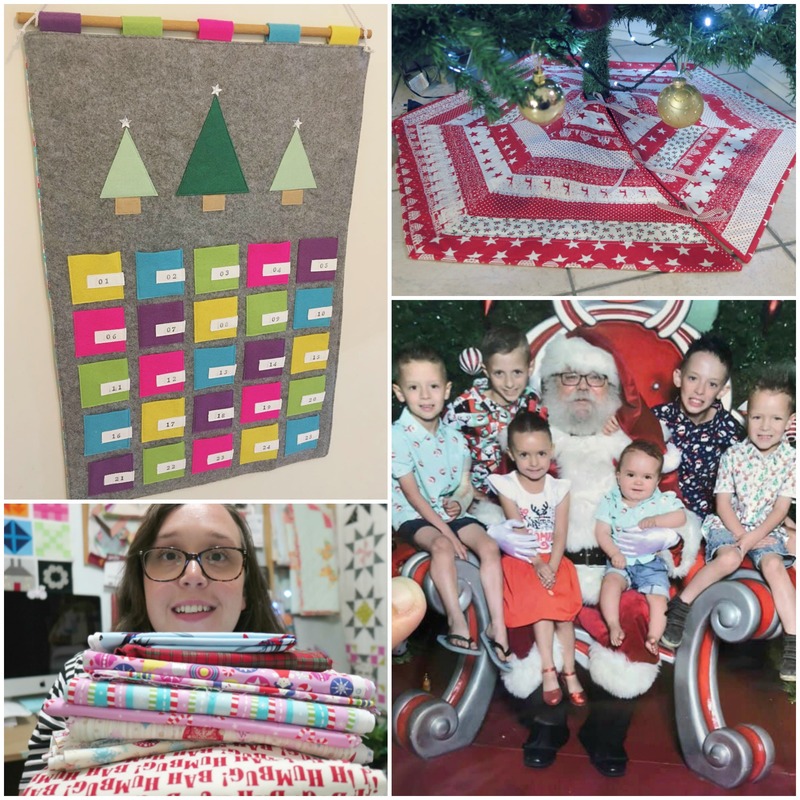 An Advent Calendar and a Christmas Tree Skirt! 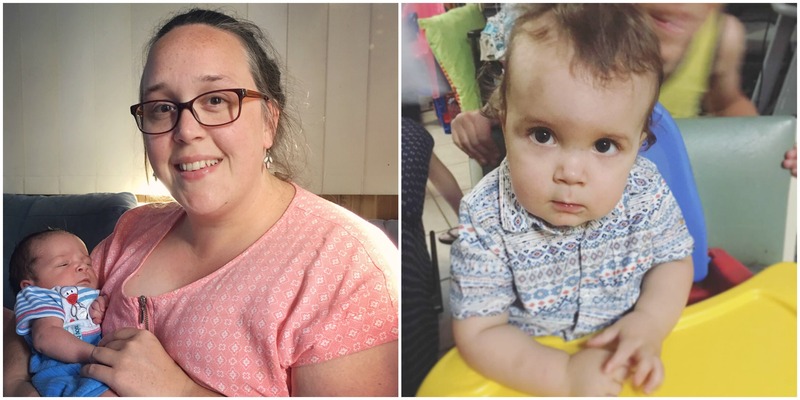 Both projects were a labour of love but so much fun to make!! I literally haven’t sewn a thing since last year! 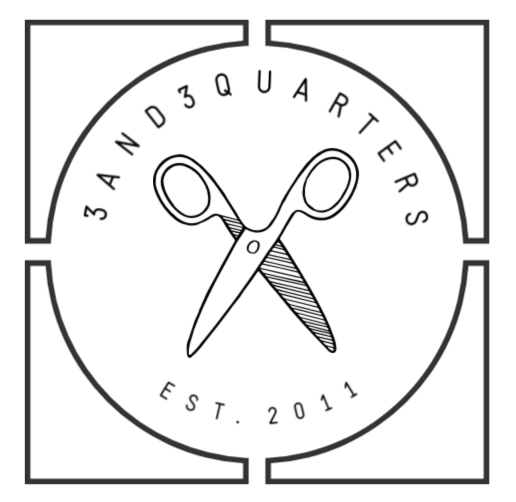 I’ve had a much needed break away from everything, re-assessed what I want to achieve and accomplish this year and have set the wheels in motion with a new blog theme, a new 3and3quarters logo and a set of goals that I’ll be sharing in my next post!